Good morning! 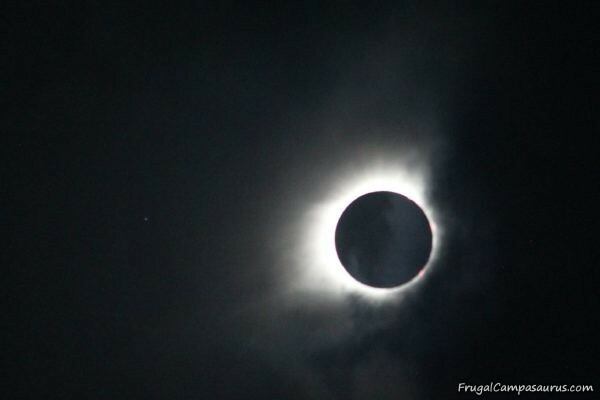 I am so excited to post this Finish it Friday article that I am going to post it early! Like the Father’s Day sand candles, this project was a surprise present. 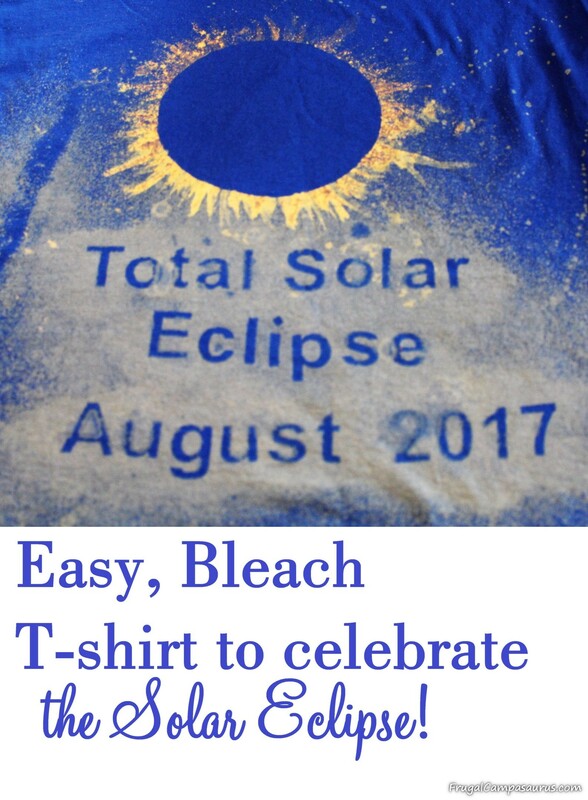 I am not good with surprises, so it was hard to not share these Homemade Bleach Gel t-shirts with the husband and with you! 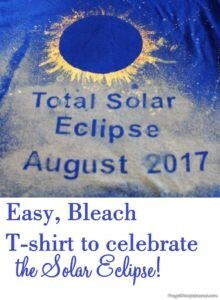 They are solar eclipse bleach t-shirts! About noon, the rain stopped and we only had partial clouds. 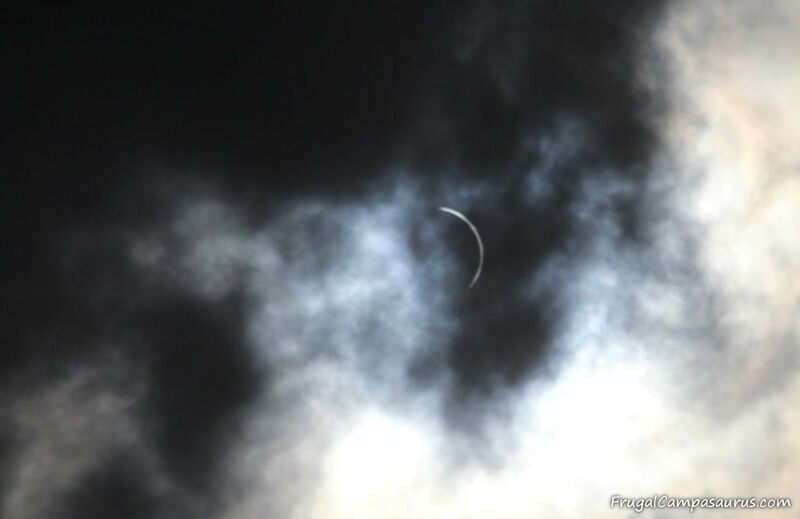 It was neat to hear everyone say ‘there it is, again!’ when the clouds would break and we could see a glimpse of the eclipse. We had a great view of totality, off and on with the clouds. 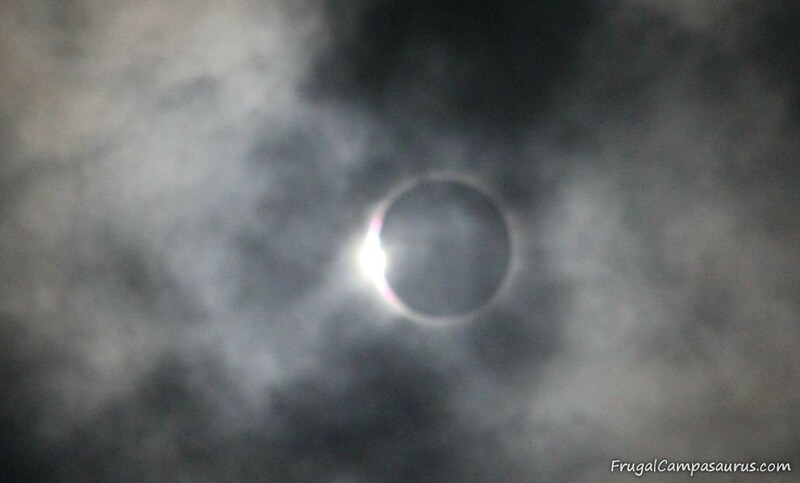 I was amazed at how dark it got and the colors by the horizon. 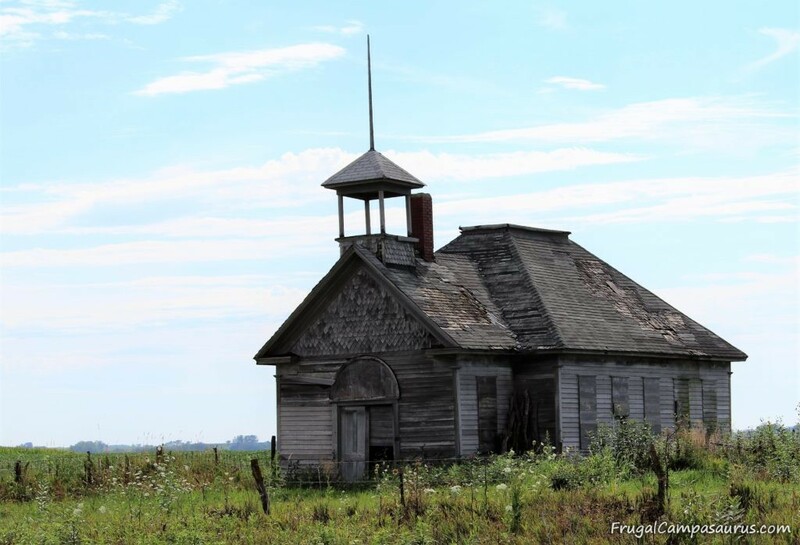 We had a fun trip home; the GPS took us on some new interesting roads and blacktops in northern Missouri and southern Iowa. Such fun curves and ‘roller coaster’ hills! We did get to see the coolest old church. Please hover over pictures for comments and directions. blue shirt in rinse waterVinyl letters worked great! Rinsing shirt in lots of water. 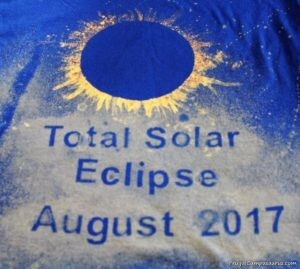 For a fun, family project, the youngest and I made solar eclipse t-shirts to wear the day of the eclipse. Even though the homemade bleach gel did not work as well when writing letter with our spray t-shirts, we tried it again using brushes. I’m still undecided about the homemade bleach gel. 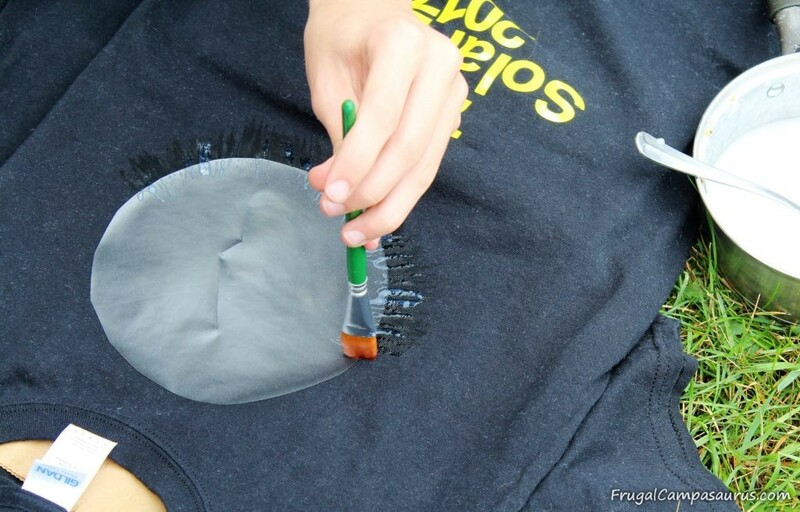 The gel is easy to make and when we made spray shirts using the gel to write letters, I gave specific instructions that may help some with writing. Also, please remember that bleach is dangerous and will permanently discolor your clothes and any surrounding materials and fabrics. Especially towels, thankfully I have many kitchen towels. 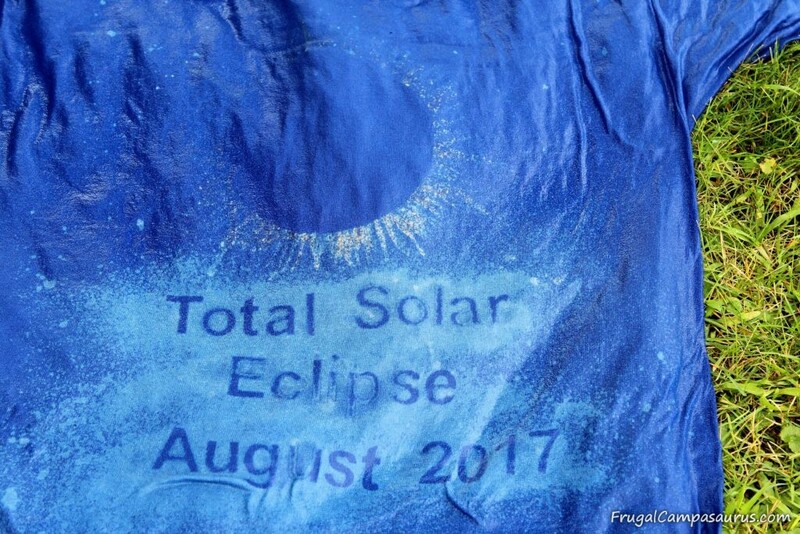 This time, I did not place the gel in a bag. We used a brush directly from a pan. It did work better, but our results were mixed. 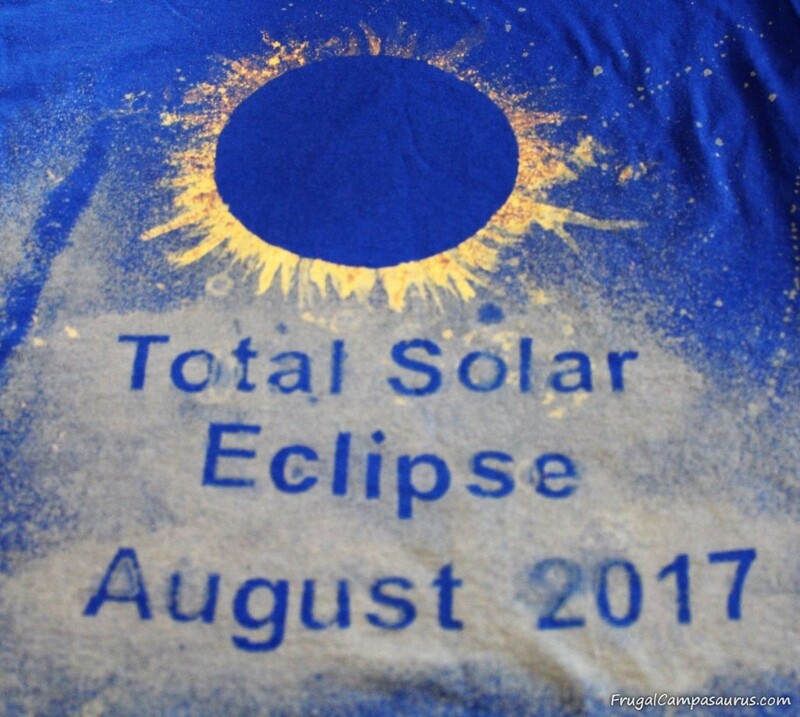 The idea was to place a contact paper circle (the sun) in the center of the t-shirt and brush rays out with the bleach gel. The practice shirt and the husband’s shirt turned out great! The youngest and mine-not so great. 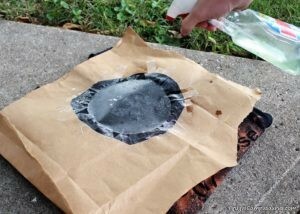 The homemade bleach gel did get thinner since we did our shirts last. I also wonder if we did not apply it as heavy. 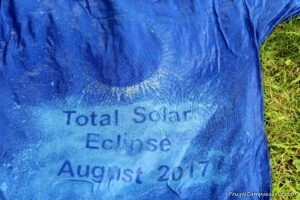 All the shirts sat with the gel about 5-10 minutes, though the sample and the husband’s shirts had a thicker, gloppier layer of gel. I think that made a huge difference. After washing and drying, the youngest and I redid our shirts. 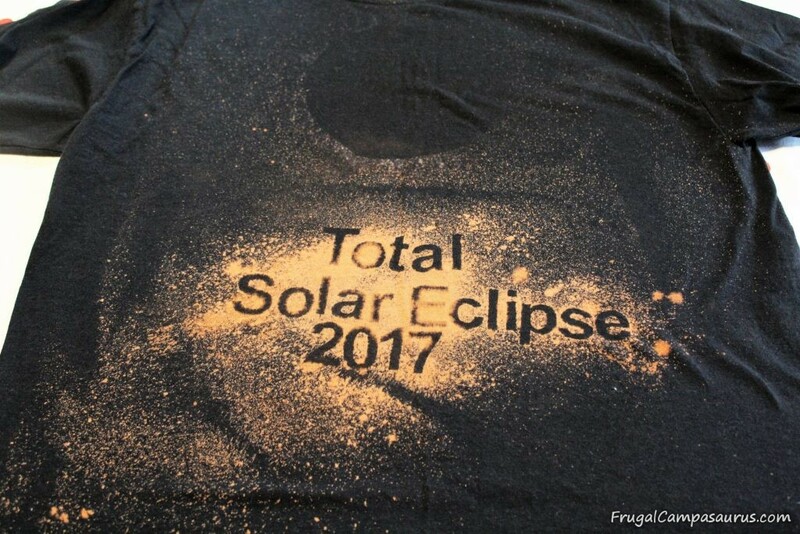 Instead of remaking the bleach gel, we choose to mask off the shirts and spray diluted bleach solution. 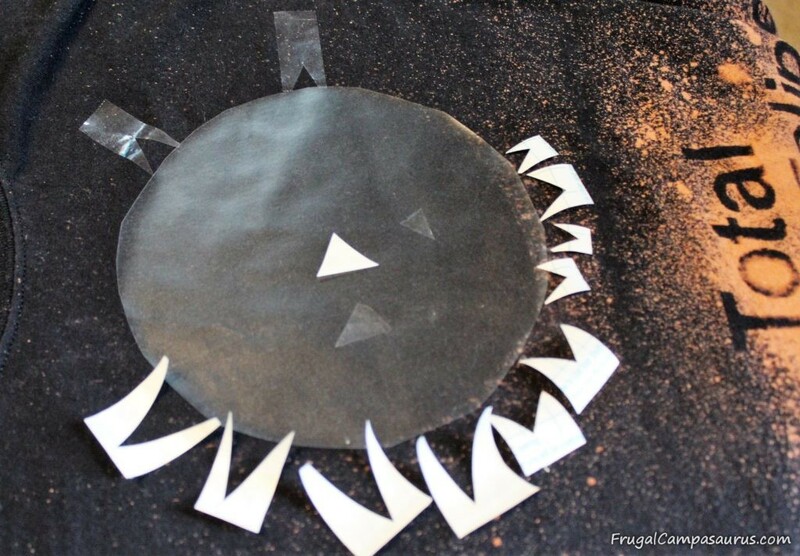 After reapplying a contact paper sun, we put scotch tape down to outline the rays. That was a lot of tape! I then taped pieces of paper bags to prevent overspray from the bleach. 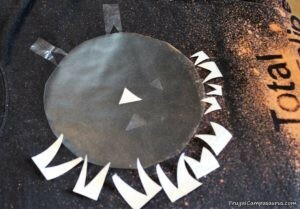 The youngest cut a large circle from the bag and then taped rays out to it- much easier. When he sprayed, the rays turned out nice. He let it sit a few minutes, and then dunked it in water. 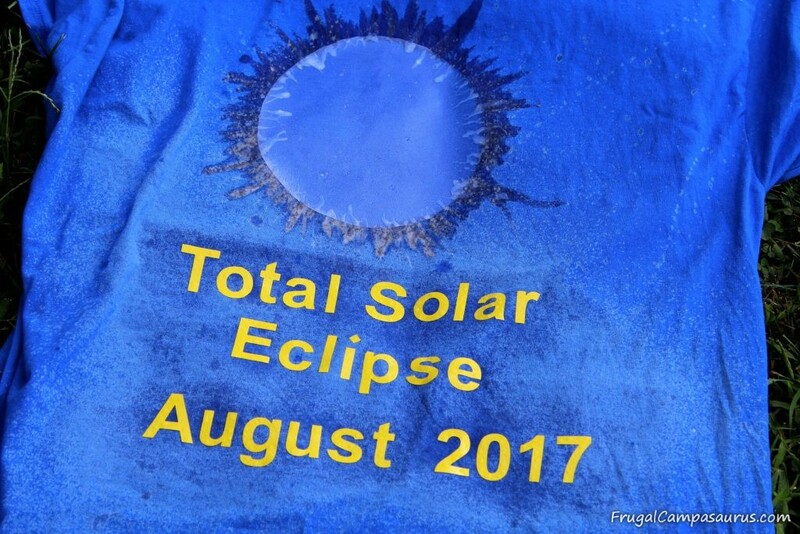 His retry produced a nice solar eclipse shirt. Mine-still not so great. I, evidently, did not firmly press down the contact paper, so it started to bleed bleach underneath. How sad! I had to dunk it right away to prevent ruining the shirt, oh well; at least I have some rays. I did not try again. I really enjoyed doing the letters on all the shirts though! The oldest has a vinyl cutter, so he printed the letters for us! So sweet! It worked great to take the background vinyl off first, so we could see the letters we were going to use. Frugal me wanted to save the background vinyl and use it for something, anything; but I was afraid the husband would find it and ruin the surprise. We also used the edge of the paper to line up the letters; at least they were mostly straight and not headed downhill. I think stickers would also work, though a practice fabric scrap is always a good idea. We did not use the homemade bleach gel for the letters; we used a diluted bleach solution and a spray bottle just like when we did the silhouettes. Remember, bleach is very dangerous, never mix with anything, rinse only with water and definitely wear old clothes. I get more splotchy paint clothes by trying to use bleach, even just for cleaning! Thankfully, we were able to work outside this time and I did not have to worry about the shower curtains or carpet. We were trying to wait for the gel to bleach out more, so we waited a bit too long after spray bleaching the letters. Some of the letters got bleach underneath, but not too bad. The youngest actually likes the shadowy effect. Next time I do letters, I will spray them last and dunk the shirt as soon as I see changes in the color. 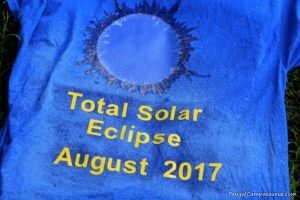 Over all, the solar eclipse shirts were a great success– the husband liked them, and we got a ‘nice shirt’ and a few smiles on eclipse day. I may not do homemade bleach gel again, but I said that last time too. 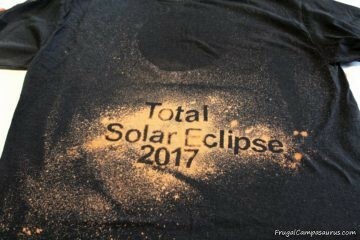 I’m excited to try the spray bleach letters again, though I will definitely not wait for the next eclipse! Happy Camping (or enjoying a quick day trip)! Next Post:Bag of Fun can make Your car ride more enjoyable!